Журнал является источником самой последней информации, советов и идей для всех, кто строит или ремонтирует свой дом. Журнал является источником самой последней информации, советов и идей для всех, кто строит или ремонтирует свой дом. 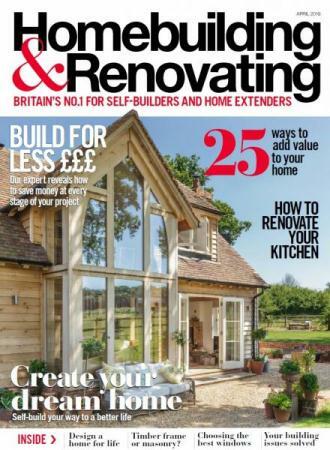 Homebuilding & Renovating is the UK’s best selling self-build magazine. Full of inspiration and practical advice for your project, the magazine also features a regular Beginner’s Guide section with advice on finding the finance, build costs, insurance and planning to help you get started. It also includes reader case studies with personal stories and tips, plus houseplans, costs and contacts for each story, plus special features on DIY, step-by-step guides on how to manage your contractors, and advice on how to complete your project on time and within budget. Скачать "Homebuilding & Renovating №4 (April 2019)"